Practical ideas for cutting back, paring down, simplifying and enjoying the holiday more when you have fewer people at the Thanksgiving table. One of the most relaxing Thanksgivings I have had was a deliberately low key affair. 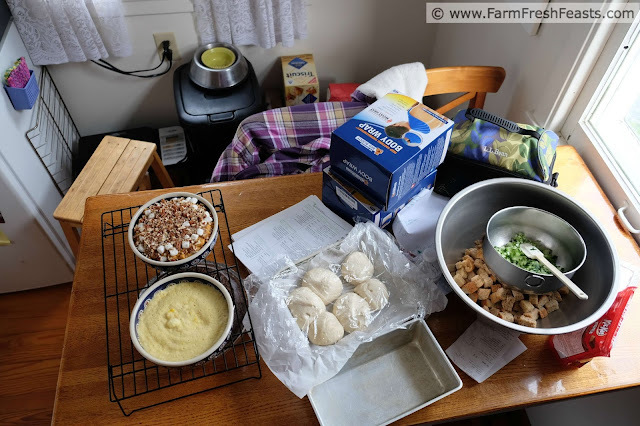 Because it was my house/my kitchen/my table, we did have 2 kinds of locally sourced vegetable sides from the Community Supported Agriculture (CSA) farm share as well as stuffing and mashed potatoes and warm rolls and turkey and gravy and pie. But not too much . . . . It's adorable how the dogs get in line when we're serving in the kitchen. Last year we were 3 at the Thanksgiving table. By choice. 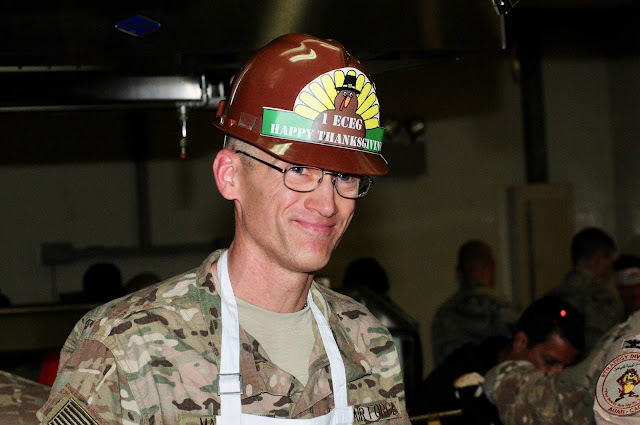 My spouse was deployed, and while we've often shared others' tables during previous deployments, I just didn't have it in me again. I wanted to relax, chill out, spend the day in my jammies, watch my friends in the Macy's Thanksgiving Day parade, and just not fuss with being at a certain place or eating at a certain time. I felt selfish and indulgent and I went with those feelings because, when he's on his 5th deployment, I've kinda earned the right to say 'nah, thanks but no thanks, we're good staying home'. I don't need to pretend. That's not to say I'm not grateful for the offers of well-meaning friends and family. I appreciate the love and support that surrounds us each time he's gone. Each place we live manages to surpass my expectations of what 'support our troops' means to the families back home. As an aside, I'll offer a couple of tips if you've got a friend or neighbor who's dealing with a deployment: don't wait for her/him to ask for help. Offer concrete suggestions for ways you're comfortable lending a hand. From shoveling snow, raking leaves, mowing grass, edging the sidewalk, picking up a gallon of milk or some children's cold medicine while you're out running errands, taking and sharing your photos or recordings of the school play--there's something you can do to lighten the load of the family left behind that they'd appreciate but won't ask you to do. Show up. Offer. And if your offer is declined--offer again at another time. I'd imagine these tips would work for chronic illness or other long term situation where folks need kindness. 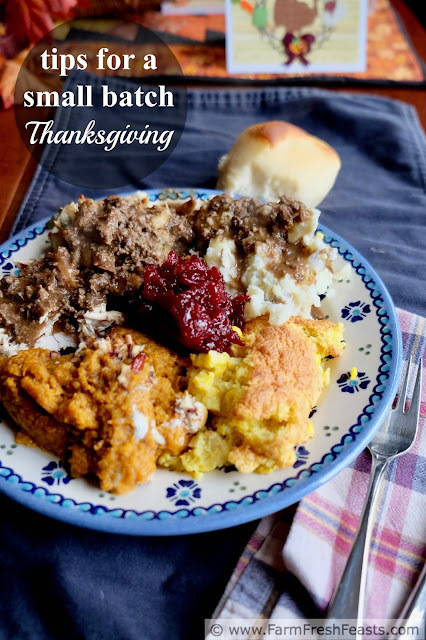 Let's move along to the reason for this post--since I chose to scale back for the big Thanksgiving meal, the most important step was to communicate with the other members of my family. We talked about what's most important to us, food-wise, to see on the table and then I made a plan for how to make that happen. If your thing is pies, then bake what you want and offer half to another family, a fire station, or a soup kitchen. 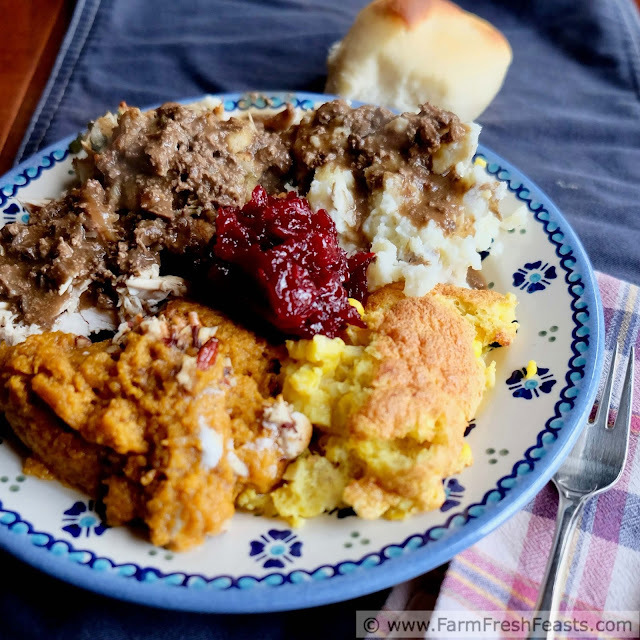 If you go for multiple side dishes, like I do, reduce the casserole size or share with a neighbor like I did with my Dairy Free Corn Pudding Casserole. If you are a fan of freshly baked rolls, try something like Make Ahead Bread Buttermilk Rolls and just bake the amount of rolls you need for the day. Let's talk turkey--since our turkey is local, from a small family farm nearby, getting 'just a breast' is not an option. If that's an option for you--go for it. You set the time you want to eat. Don't worry about when Other People think Thanksgiving dinner needs to happen. What if you have relatives who are always late and mess up your timing? Doesn't matter! Do you want to watch the parade instead of standing in the kitchen? Do it. Do you want to eat Thanksgiving Dinner in front of a football game? Do it. Why not? It's your turn to do what soothes you the most. You'll notice that I've left out 'pick up a complete meal to go from a local grocery store or catering place'. I did that deliberately. 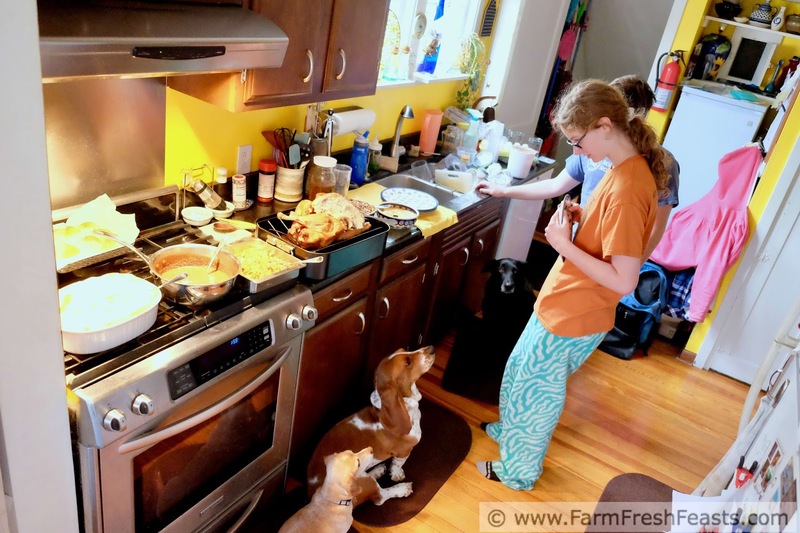 After all, this site supplies recipes to people who are trying to figure out what to do with their farm share, so I'm assuming that you're going to be in the kitchen cooking because you want to do so. If that's not the case, good grief get take out, or go to Waffle House if that's your thing (they are open). The key is that you're creating the meal experience that makes you most happy, since you don't have to factor in too many others' opinions about the day. Yes, it's a mess--the pie is hiding under the sides & rolls ready to go into the oven. I still need to make the stuffing. 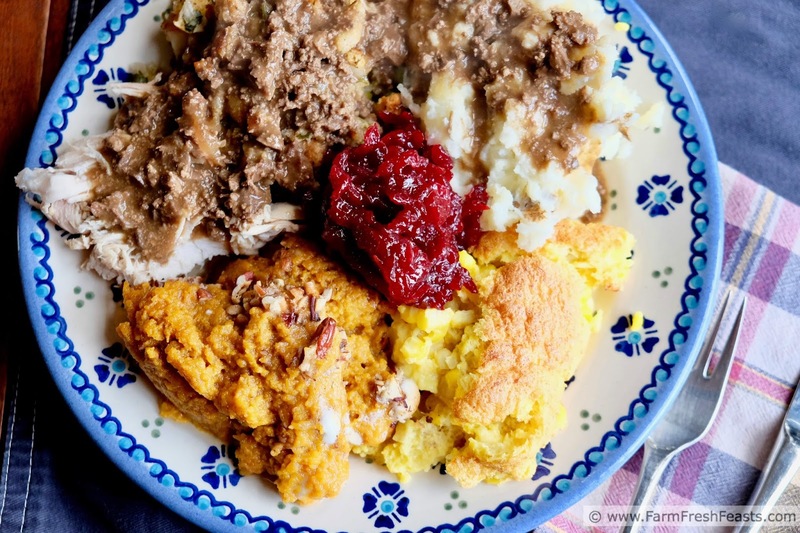 Oh, and one more thing about making Thanksgiving your way--you get the right amounts of the leftovers you love! (This is Turkey Spinach Pesto Pizza, one of my many pizza recipes using Thanksgiving leftovers, since Friday nights are Pizza Nights around here). 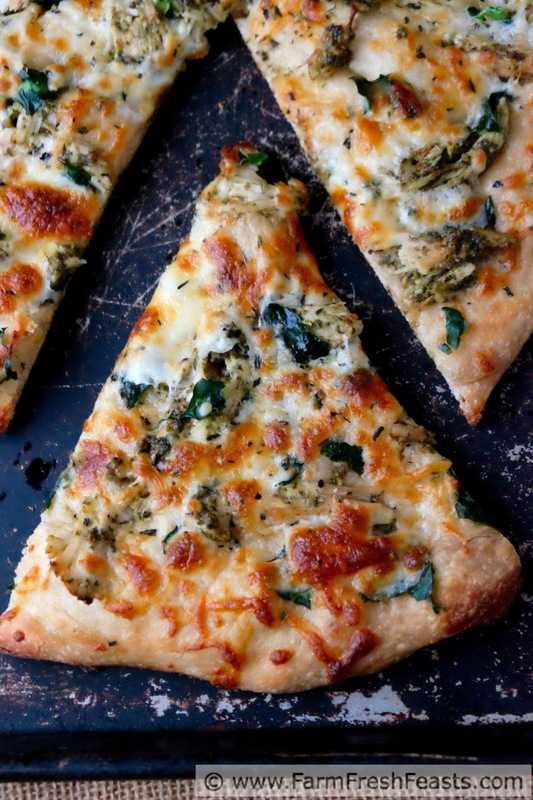 See more pizza recipes in my Visual Pizza Recipe Index. See more recipes in my Visual Recipe Index by Ingredient. 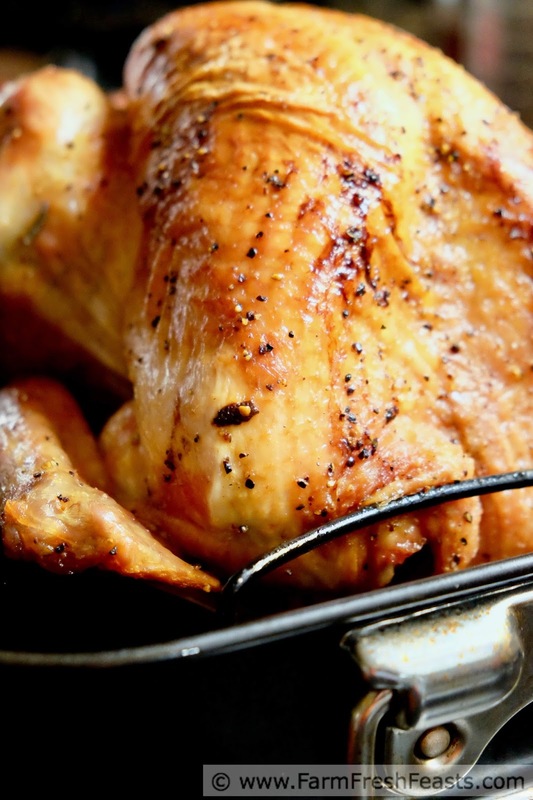 See more Thanksgiving Recipe ideas here. One of my favorite Easter memories was the year we stayed home just the two of us. No traveling across the state or to another state for a big meal with lots of folks. We kept it low key, decorated eggs and turned them into deviled eggs for dinner. I'll always remember that holiday fondly.